After previously writing about the basal ganglia and the crucial role they play in vision and brain plasticity, I was intrigued and wanted to understand what implications binocular vision dysfunctions have for the brain as a whole more thoroughly. In this post, part 1, I will introduce more related brain areas involved in visual processing one by one. In part 2 I want to provide a more cohesive view of what is told in part 1, a illustrative summary if you will, explaining how this relates to earlier discoveries and my own experiences over the years. The cerebral cortex is connected to various subcortical structures such as the thalamus and the basal ganglia, sending information to them along efferent connections and receiving information from them via afferent connections. 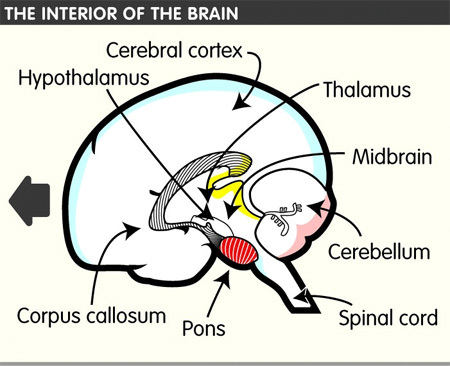 Most sensory information is routed to the cerebral cortex via the thalamus. The cortex is commonly described as comprising three parts: sensory, motor, and association areas. 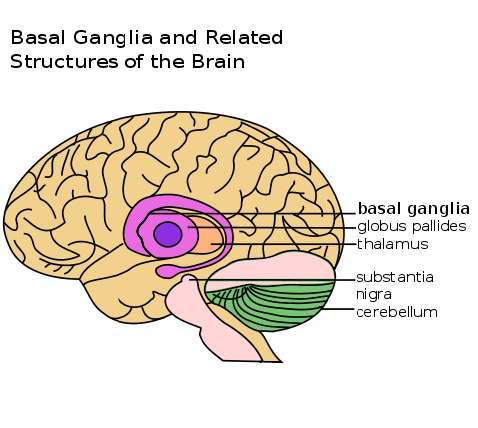 The basal ganglia comprise a group of structures that regulate initiation of movements, balance, eye movements and posture. They are strongly connected to other motor areas in the brain and link the thalamus with the motor cortex. The basal ganglia are also involved in cognitive and emotional behavior and play an important role in reward and reinforcement, addictive behaviors and habit formation. The thalamus is heavily involved in relaying and processing sensory information between cortex and brain stem and within cortical structures. Because of its role as relay between various subcortical areas and the cerebral cortex, the thalamus contributes to many processes in the brain including perception, attention, timing and movement. It plays a central role in alertness and awareness. For the visual system, for example inputs from the retina are sent to the lateral geniculate nucleus of the thalamus, which in turn projects to the primary visual cortex (area V1) in the occipital lobe. Similarly the medial geniculate nucleus acts as a key auditory relay between the inferior colliculus of the midbrain and the primary auditory cortex etc. The thalamus is believed to both process sensory information as well as relay it – each of the primary sensory relay areas receives strong “back projections” from the cerebral cortex. The thalamus also plays an important role in regulating states of sleep and wakefulness. Thalamic nuclei have strong reciprocal connections with the cerebral cortex forming thalamo-cortico-thalamic circuits that are believed to be involved with consciousness. A major role of the thalamus is devoted to “motor” systems. The neural information processes necessary for motor control were proposed as a network involving the thalamus as a subcortical motor center Through investigations of the anatomy of the brains of primates the nature of the interconnected tissues of the cerebellum (see below) to the multiple motor cortices suggested that the thalamus fulfills a key function in providing the specific channels from the basal ganglia and cerebellum to the cortical motor areas. In an investigation of the saccade and antisaccade motor response in three monkeys, the thalamic regions were found to be involved in the generation of antisaccade eye-movement. The role of the thalamus in the more anterior pallidal and nigral territories in the basal ganglia system disturbances is recognized but still poorly understood. The thalamus is functionally connected to the hippocampus (see below) as part of the extended hippocampal system at the thalamic anterior nuclei with respect to spatial memory and spatial sensory datum they are crucial for human episodic memory and rodent event memory. There is support for the hypothesis that thalamic regions connection to particular parts of the mesio-temporal lobe provide differentiation of the functioning of recollective and familiarity memory. The cerebellum monitors and regulates motor behavior, particularly automatic movements. Some recent studies have associated the cerebellum with cognitive functions, such as learning and attention. Although the cerebellum accounts for roughly 10% of total brain weight, it contains more neurons than the rest of the brain combined. The hippocampus is the structure in the brain most closely aligned to memory formation. It is important as an early storage place for long-term memory, and it is involved in the transition of long-term memory to even more enduring permanent memory. The hippocampus also plays an important role in spacial navigation. For a TED talk on the hippocampus click here. The above text is mainly based on Wikipedia and the 3DBrain Android application. It’s possible you don’t really see the connection between these facts and more importantly why they are such a big deal to understanding the true nature and effect of vision dysfunctions, so stay tuned for Part 2 in which everything will come together through (graphic) illustration. This is wonderful! Thank you for posting this Michael!! !